Sheriff Jeff Mann began his public service career in 1981 by enlisting in the United States Air Force. In 1987, he continued his post-secondary education at the University of Illinois where he earned his Bachelor of Arts degree in Political Science. Sheriff Mann also attended University of Michigan’s Law School where he earned his Juris Doctorate Degree in 1990. After working in private practice – specializing in Employment and Labor Law – he secured a position with the DeKalb County Law Department as an Assistant County Attorney. 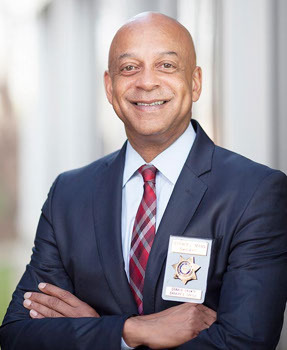 While working in the DeKalb County Law Department, Sheriff Mann provided legal assistance to various county agencies and was also the lead trial attorney for the DeKalb CEO, Board of Commissioners, and Department Directors. In 2001, Jeff Mann began his career with the DeKalb County Sheriff’s Office as Director of Labor Relations and Legal Affairs. He was eventually promoted to Chief Deputy under Sheriff Tom Brown. Mann’s role as Chief Deputy included overseeing the day-to-day operations of the Sheriff’s Office, including its four major divisions – Jail, Field, Court and Administrative. Jeff Mann was responsible for approximately 860 full-time employees and a yearly budget of over $78 million dollars. In March 2014, Jeff Mann was appointed to fill the remaining term of Sheriff Tom Brown. In July 2014, he won a Special Run-off Election with 76% of the vote, and was duly elected the 49th Sheriff of DeKalb County. Today, Sheriff Mann is running to be elected to a full four-year term.